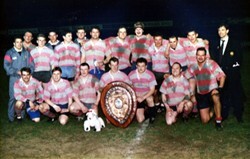 Olney RFC, Lewis Shield winners 1996, colour team photograph, with Shield. Back row: I. Kemp, C. Day, F. Foxley, S. Elliot, S. Rolfe, A. Revitt, S. Dobson, G. Graham, M. Lay, D. Sands, D. Baseley, S. Howkins. Front row: D. King, N. Shelton, P. Wetherup, C. Williams, M. Rawlins (Captain), M. Grady, S. Brown. E. Bowden (Coach).